Environmental Health Sourcebook, 5th Ed. 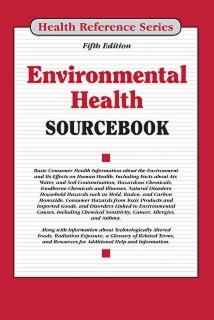 Environmental Health Sourcebook, Fifth Edition, offers updated information about the effects of the environment on human health. It discusses specific populations—including pregnant women and their fetuses, children, the elderly, and minorities—in which the effects of environmental exposures are especially harmful and, in some cases, can have a lasting impact that extends to future generations. Airborne, waterborne, foodborne, and chemical hazards are discussed, and facts about cancer, respiratory problems, infertility, autism, and other diseases with suspected environmental triggers are presented. A section on consumer products and medical hazards examines health risks associated with some common household items. The book concludes with a glossary and a directory of resources for additional information. Part I: Understanding the Health Effects of Environmental Hazards provides information and risk assessment tools to help readers determine what health threats may be present in the world around them. It offers suggestions for reducing possible exposure to dangers, and it discusses issues of special concern to children, pregnant women, the elderly, and minority populations. It also explains the connection between human health and climatic changes. Part II: Health Concerns and Their Environmental Triggers provides readers with in-depth details on individual diseases with suspected environmental causes, including chemical sensitivity, cancer, respiratory problems, and certain viruses. It details the effects of the environment on fertility and pregnancy, and it explains how environmental factors might be cause autism. Part III: Outdoor Environmental Hazards: Air, Water, and Soil explores hazards, both natural and man-made, that are found in the outdoor environment. Readers will learn about pollution in air and water, as well as how chemicals and pesticides have spread through the food chain and how they can be avoided. It also explores hazards—such as noise and light pollution, smog and acid rain, and climate change—caused by the modern urban environment. Part IV: Household and Indoor Hazards discusses the hazards people face in the environment where they spend up to 90% of their time—inside their homes, offices, and schools. These risks include indoor air contaminants, such as carbon monoxide, mold, asbestos, and lead, as well as unsafe indoor activities, such as smoking or inappropriately using chemicals and pesticides. The part concludes with the effects of electric and magnetic field exposure. Part V: Foodborne Hazards includes facts about food safety regulations, potentially problematic food additives, and chemical contaminants in the food supply. It provides tips for avoiding the most common foodborne illnesses and for safely preparing food at home. Because most Americans rely on the industrial food chain for the majority of their food, it also discusses safety concerns related to food technologies, including genetic engineering, the use of antibiotics and hormones, and nanoparticles. Part VI: Consumer Products and Medical Hazards tells readers about the health risks they face from consumer products, including everyday objects such as hand soap, insect repellents, and plastics. It discusses the safety of imported goods, now found in virtually every home, and it describes concerns about the use of untested chemicals and additives in personal care products, such as cosmetics and sunscreens. Part VII: Additional Help and Information includes a glossary of important terms and a directory of organizations providing information and advocacy on environmental health topics.